Proper nutrition is essential to the health and comfort of oral tissues and healthy tissues enhance the possibility of successful prosthodontic treatment in the elderly. 1. To establish a balanced diet which is consistent with the physical, social, psychological and economic background of the patient. 2. To provide temporary dietary supportive treatment, directed towards specific goals such as carries control, postoperative healing, or soft tissue conditioning. 3. To interpret factors peculiar to the denture age group of patients, which may relate to or complicate nutritional therapy. • With a decline in lean body mass in the elderly, caloric needs decrease and risk of falling increases. • Vitamin D deficiency in turn, is a major cause of metabolic bone disease in the elderly. • Declines in gastric acidity often occur with age and can cause malabsorption of food-bound vitamin B12. • Many nutrient de­ficiencies common in the elderly, including zinc and vitamin B6, seem to result in decreased or modified immune responses. • Dehydration, caused by declines in kidney function and total body water metabolism, is a major concern in the older population. • Overt deficiency of several vitamins is associated with neurological and/or behavioral impairment B1 (thiamin), B2, niacin, B6 [pyridoxine], B12, foliate, pantothenic acid, vitamin C and vitamin E). • A host of life-situational factors increase nutritional risk in elders. • Elders, particularly at risk, include those living alone, the physically handicapped with insufficient care, the isolated, those with chronic disease and/or restrictive diets, reduced economic status and the oldest old. • Functional disabilities such as arthritis, stroke, vision, or hearing impairment, can affect nutritional status indirectly. • Most elders take several prescription and over-the-counter medications daily. • Prescription drugs are the primary cause of anorexia, nausea, vomiting, gastrointestinal disturbances, xerostomia, taste loss and interference with nutrient absorp­tion and utilization. These conditions can lead to nutrient deficiencies, weight loss and ultimate malnutrition. • Xerostomia affects almost one in five older adults. Xerostomia is associated with difficulties in chewing and swallowing, all of which can adversely affect food selection and contribute to poor nutritional status. • The use of drugs with hypo salivary side effects may have deleterious influence on denture bearing tissues. • Deficient masticatory performance leads to consumption of more drugs, than those with superior performance. • Age-related changes in taste and smell may alter food choice and decrease diet quality in some people. Factors contributing to this reported decreased function may include health disorders, medications, oral hygiene, denture use and smoking. • Sense of smell decreases markedly with age, much more rapidly then the sense of taste. Diminished taste is the result of aging. • Sensory changes may diminish the appeal of some foods (e.g., sensitivity to the bitterness of cruciferous vegetables), limiting their consumption and potential health benefits function. • Periodontal disease also increases with age and may be exacerbated by nutritional deficiencies. • Poor oral health leads to impaired masticatory function. Whether MF plays a role in food selection is still matter of debate, but impaired masticatory function leads to inadequate food choice and therefore alter nutrition intake. • The presence of natural teeth and well fitting dentures were associated with higher and more varied nutrition intakes and greater dietary quality, in the oldest old Iowans sampled. • A full upper denture can have an impact on taste and swallowing ability. • The hard palate contains taste buds, so taste sensitivity may be reduced when an upper denture covers the hard palate. As a result, swallowing can be poorly coordinated and dentures can become a major contributing factor to death from choking. • As adults age, they tend to use more strokes and chew longer, to prepare food for swallowing. • Masticatory efficiency in complete denture wearers is approximately 80% lower than in people with intact natural dentition. • The effect of dentures on nutritional status varies greatly among individuals. 1. Some people compensate for decline in masticatory ability by choosing processed or cooked foods rather than fresh food and by chewing longer before swallowing. 2. Others may eliminate entire food groups from their diets. Dentate adults tend to eat more fruits and vegetables than full-denture wearers. • Replacing ill-fitting dentures with new ones does not necessarily result in significant improvements in dietary intake. • Similarly, exchanging optimal complete dentures for implant-supported dentures, has not resulted in significant improvement in food selection or nutrient intake. • Energy needs decline with age due to a decrease in basal metabolism and decreased physical activity. • Cross-sectional surveys show that the average energy consumption of 65-74 year old women is about 1300 kilocalories (Kcal) and 1800 Kcal for men of the same age. • Deficiency causes dull, dry, sparse easily plucked hair, parotid gland enlargement, muscle wasting, pallor, pale atrophic tongue, spoon nails and pale conjunctiva. • Caloric requirements decrease with advancing age, owing to reduced energy expenditures and a decrease in basal metabolic rate. • The mean RDA is 1600 Kcal for women and 2400 Kcal for men. • As the patients become older, the amount of protein required increases. • Protein depletion of body stores in the elderly, is seen primarily as a decrease of the skeletal muscle mass. Proteins is a must for denture wearers. • The RDA for proteins, for persons aged 51 and over, is 0.8-g protein/kg body weight per day. (56 gms for males and 46 gms for females, or 9 and 10% respectively, of the recommended calorie intake). However, because of the general decline in energy intake, as age increases, the recommendation is that the elderly should satisfy 12% or more of their energy intake with protein-rich foods. • The best sources of proteins for the elderly diet are dairy products, poultry, meats and fish in the boiled and not dried form. Nuts, grains, legumes and vegetables contain protein, which if eaten in the proper combination, is of the same quality as animal sources of protein. • Deficiency of proteins causes edema. • The elderly consume a large proportion of their calories as carbohydrates, possibly at the expense of protein, because of their low cost, ability to be stored without refrigeration and ease of preparation. • The recommended range of intake is 50 to 60 per cent of total calories. • Food sources include grains and cereals, vegetables, fruits and dairy products. • An important component of complex carbohydrates is fiber, which promotes bowel function, may reduce serum cholesterol and is thought to prevent diverticular disease. • Fiber in the form of bran is frequently added to dry cereals and breads, but vegetable fiber is more effective and less expensive. • Reduced selection of foods rich in fiber that are hard to chew, could provoke gastrointestinal disturbances in some edentulous elderly, with deficient masticatory performance. • A study conducted on the impact of edentulousness on nutrition and food intake, inferred that even 1 gram of difference in dietary fiber intake between the dentate and edentulous, could lead to approximately 2% increased risk of myocardial infarction. • Elderly are particularly susceptible to negative water balance, usually caused by excessive water loss through damaged kidney. • Inadequate intake of fluid by the elderly will lead to rapid dehydration and associated problems such as hypotension, elevated body temperature and dryness of the mucosa, decreased urine output and mental confusion. • Under normal conditions, fluid intake should be at least 30 ml per kg body weight per day. • The RDA for vitamin A is 800-1000 micrograms RE . • Vitamin A in food occurs in two forms: retinal, or active Vitamin A in animal foods (liver, milk and milk products and beta-carotene or pro­vitamin A, found in deep green and yellow fruits and vegetables (apricots, carrots, spinach). • Deficiency causes Bitot's spots (eyes), conjunctival and corneal xerosis (dryness), xerosis of skin, follicular hyperkeratosis, decreased salivary flow, dryness and keratosis of oral mucosa and decreased taste acuity. • Long standing deficiency may cause hyperplasia of the gums, as well as generalized gingivitis. • Evidence of thiamine deficiency occurs most often in the poor, institutionalized and alcoholic segment of the elderly population. • The RDA has been set at 0.5 per 1000 calories, or at least 1 mg daily. • Food sources include meats (especially pork and chicken), peas, whole grains, fortified grains, cereals and yeast. • Ranges from 50 to 90% of the elderly affected, which may be an important cause of the increased prevalence of the carpal tunnel syndrome (an inflamed tendon attached to the wrist bone.) in the elderly. • The RDA is 1.2-1.4 mg .
• Deficiency causes nasolabial seborrhea, glossitis. • The RDA is 3.0 microgram. • Is found in kidney, heart, milk, eggs, liver and green leafy vegetables. • Deficiency causes nasolabial seborrhea, fissuring and redness of eyelid corners and mouth magenta-colored tongue and genital dermatosis. • The RDA is about 60 microgram . • Food sources include citrus fruits, tomatoes, potatoes and leafy vegetables. • Deficiency causes spongy, bleeding gums, petechiae, delayed healing tissues, painful joints. • The elderly are frequently deficient in Vitamin D because of lack of sun exposure and an inability to synthesize Vitamin D in skin and convert it in the kidney. Vitamin D is found in fish liver oils. • The RDA is 5 microgram. • Deficiency causes bowlegs, beading of ribs. • Vitamin E deficiency in the elderly does not seem to be a problem. Total plasma vitamin E levels increase with age. • The RDA is 8-10 mg alpha-TE . A study conducted by J. Crystal Braxter illustrated deficiencies in magnesium, fluoride, folic acid, zinc and calcium, in the geriatric population. • Economically deprived urban blacks and institutionalized elderly are at the most risk of foliate deficiency. • RDA is 500 microgram. • Good food sources of folic acid include leafy green vegetables, oranges, liver, legumes and yeast. • Deficiency causes megaloblastic anemia, mouth ulcers, glossodynia, glossitis, stomatitis. •· The recommended daily allowance of calcium is 800 mg/day. • Because calcium absorption is decreased in the elderly (lack of hydrochloric acid in the stomach), the calcium must be acidulated before digestion. • Lactase deficiency resulting in lactose intolerance is also common in elderly persons. This is another reason for modifying the milk for elderly persons. • Food sources of calcium include milk and milk products, dried beans and peas, canned Salmon, leafy green vegetables and tofu. • Elderly patients with complete dentures often experience a rapid and excessive ridge resorption, which may be related to negative balance of calcium, which contributes to development of osteoporosis. • A recent review concluded that the prevalence of iron deficiency, is relatively rare among the healthy elderly. When anemia is found in an older person, blood loss should be suspected. • The RDA for iron is 10 mg.
Good food sources include meat, fish, poultry, whole grains, fortified breads and cereals, leafy green vegetables, dried beans and peas. • Deficiency causes burning tongue, dry mouth, anemia's and angular cheilosis. • Zinc utilization declines with advancing age, because intestinal absorption decreases after the age of 65 years. • The RDA is 15 mg.
• Good sources of zinc are animal products, whole grains and dried beans. • Deficiency causes decreased taste acuity, mental lethargy and slow wound healing. A new food pyramid has been designed for people aged 70 years and above, to reflect the unique needs of older people [Figure - 1]. The first phase should be used to screen all patients and consists of obtaining information from a medical-social history, screening for clinical signs of deficiency, conducting selected anthropometrical measurements and assessing the adequacy of dietary intake. The purpose of the dietary assessment is to determine what an individual is eating now, what he or she has eaten in the past and recent changes in the diet. 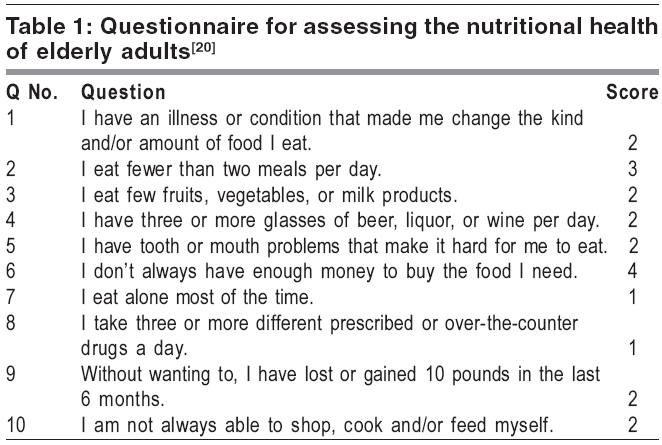 A questionnaire has been developed to identify older individuals with nutritional problems (Vogt et al , 1995) [Table - 1],[Table - 2]. This questionnaire may be administered by health care professionals and applied in both inpatient and outpatient settings. If potential nutritional problems are detected, based on any of these parameters, the nutritional evaluation should progress to Phase II. However, if at the conclusion of Phase I, enough information is available to ensure a rational basis for therapy, the nutritional assessment should be terminated and appropriate dietary counselling instituted. When the parameters described here indicate the existence of a nutritional problem, more information should be accumulated. A semiquantitative dietary analysis and routine blood chemistry should be undertaken. • At this level of evaluation, dietary intake is assessed using more quantitative means. Nutrients in all foods and beverages consumed during a 3- to 5-day period, are calculated using Food Composition Tables, or computer-assisted nutrient analysis programs. • Average caloric and nutrient intakes can be quantitated and compared with norms. The services of a registered dietician, serving as a consultant, are invaluable at this level of assessment. • Common automated blood tests are also useful in providing more definitive information regarding the nutritional status of the patient. • However, most indices fall within standard ranges for young adults and many of the parameters are affected by an age-related decline in renal function and body water, as well as the effects of drugs and chronic disease. The final phase of the analysis is reserved for more complex nutritional problems and should be accomplished under the direction of a physician. The analysis in this phase includes comprehensive nutritional biochemical assays of blood, urine and tissues, as well as tests of metabolic and endocrine function. a. 2 servings of good sources of vitamin C, such as citrus fruits, salad greens and raw cabbage. b. 1 serving of a good source of provitamin A such as deep green and yellow vegetables or fruits. c. 1 serving of potatoes and other vegetables and fruits. 2. Four servings of enriched breads, cereals and flour products. 2. Four servings of enriched breads, cereals and flour products. 3. Two servings of milk and milk-based foods, such as cheese. 4. Two servings of meats, fish, poultry, eggs, dried beans, peas, nuts. 5. Additional miscellaneous foods including fats, oils and sugars, as well as alcohol; the only serving recommendation is for about 2-4 tablespoons of polyunsaturated fats, which supply essential fatty acids. The logical sequence of eating food is biting, chewing and swallowing and it is much easier for the new denture wearer to master this complex of masticatory movements in the reverse order. Consequently, food of a consistency that will require only swallowing, such as liquids, should be prescribed for the first few days after insertion of the denture. The use of soft foods is advocated for the next few days and a firm or regular diet can be eaten by the end of the week. Bread-Cereal group: Gruels cooked in either milk or water. Milk group: Fluid milk may be taken in any form. Meat group: Eggs in eggnogs, pureed meats, meat broths, or soups. The sample menu should contain a glass of milk at least once a day. Bread-cereal group: Cooked cereals, softened breads boiled, rice, noodles and macaroni. Milk group: Fluid milk and cottage cheese. Meat group: Chopped beef, ground liver, tender chicken/fish in a cream sauce, scrambled eggs, thick soups, etc. The sample menu must include butter or margarine, a glass of milk at least once a day. By the fourth day, or as soon as the sore spots have healed, firmer foods can be eaten in addition to the soft foods. These should ideally be cut into small pieces before eating. The sample menu must contain butter or margarine and a glass of milk. • Since denture construction requires a series of appointments, dietary analysis and counseling can be easily incorporated into the treatment sequence. • The patient should be urged to see his physician for more detailed diagnostic procedures and treatment, when severe deficiency disease of any kind is present. On the other hand, advice can be given properly by the dentist, when there is obvious excessive use of cariogenic foods, evidence of imbalanced diets likely to lead to difficulty, or minimal suggestive clinical signs coupled with compatibly poor dietary habits. Many denture failures are the result of nutritional deficiencies. Good health and nutrition of older patients are necessary for the successful wearing of dentures. Ramsey WO. The role of nutrition in conditioning edentulous patients. J Prosthet Dent 1970;23:130-5. Kreher JM, Graser GN, Handelman SL. The relationship of drug use to denture function and salivary flow rate in geriatric population. J Prosthet Dent 1987;57:631-7. Brodeur JM, Laaurin D. Nutrition intake and gastrointestinal disorders related to masticatory performance in the edentulous elderly. J Prosthet Dent 1993;70:468-73. N'Gom PI, Woda A. Influence of impaired mastication on nutrition. J Prosthet Dent 2002;87:667-73. Marshall, Warren, Hand, Stumbo. Oral health, nutrition intake and dietary quality in the very old. JADA 2002;133:1369-79. Krall E Hayes, Gilbert GH, Duncan P. How dentition status and masticatory function affect nutrition intake. J Am Dent Assoc 1998;129:1261-9. Sandstead HH. Nutrition in the elderly. Gerodontics 1987;3:3-13. Palmer CA. Gerodontic nutrition and dietary counseling for prosthodontic patients. Dent Clin N Am 2003;47:355-71. Fisher WT. Prosthetics and geriatric nutrition. J Prosthet Dent 1955;5:481-5. Adams CD. Gerodontologic aspects of diet and nutrition. J Prosthet Dent 1961;11:345-50. Detroit, Mich. Nutrition for the denture patient. J Prosthet Dent 1960;10:53-60. Barone JV. Nutrition-Phase one of the edentulous patient. J Prosthet Dent 1978;40:122-6. Massler M. Geriatric Nutritional. Part 4: The role of fiber in the diet. J Prosthet Dent 1983;50:5-7. Joshipura KJ, Willet W, Douglass C. The impact of edentulousness on nutrition and food intake. JADA 1996;127:459-67. Massler M. Geriatric nutritional. Part 2: Dehydration in the elderly. J Prosthet Dent 1979;42:489-91. Baxter JC. The nutritional intake of geriatric patients with varied dentition. JPD 1984;51:164-8. Massler M. Geriatric nutritional.1: Osteoporosis. J Prosthet Dent 1979;42:252-4. Ejvind, Budtz-Jorgensen. Prosthodontics for the elderly, diagnosis and treatment. 1sts ed. Quintessence Publishing Co Inc: Illinois; 1999.